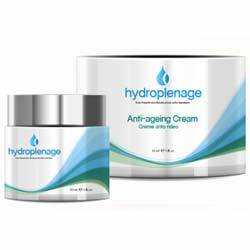 Hydroplenage is an anti-wrinkle cream whose manufacturer claims it is an excellent way to support the appearance of healthy skin. It was difficult to locate much information on that manufacturer or their policies, as the free trial offer information for this product instead connected to a website offering a similar product under a different name. Regardless, Hydroplenage is provided in jars containing 0.5 fluid ounces (15 mL) and is sold directly by the manufacturer, who offer a $4.95 “free trial” as part of a subscription program. If you do not cancel within fourteen days, your card will be charged $98.71 per month and you will be mailed a supply of the product each month until you do cancel. Return policies are available, but are for unopened product only, and do not include any refund for shipping costs. The manufacturers recommend that you use Hydroplenage by first rinsing and gently drying your face, followed by dabbing a small amount of the product to your neck and face, massaging it in for a minute or two and then leaving it alone to get gradually absorbed. They suggest using it morning and night. Hydroplenage is very expensive compared to similar products on the market, and does not seem to offer a substantial reason for that great cost. Furthermore, their lack of a satisfaction guarantee and their poorly-revealed subscription model of ordering does not suggest that the manufacturer is confident in the product’s quality. Between this, and the relatively sparse information on how the product is intended to function – which did not include any kind of clinical studies or other scientific evidence on how well its ingredients function – it is very difficult to recommend it. Please be sure to take advantage of all the information you can find on beauty products before you commit to a purchase. There are products available for every budget, and cost does not always equal quality.